Matching Gospel Pin (R) Earrings compliment the Gospel Pin (R) above perfectly. Electroplated Silver & Gold w/clear crystal center. A perfect gift for all occasions. Comes in a Gift box with Gospel Pin (R) Story illustration. 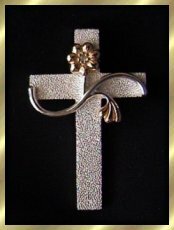 Dimensions 1/2" W x 5/8" H.
Gospel Pin(R) High Fashion Christian Jewelry as seen on QVC. 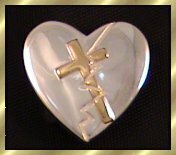 The Gospel Pin (R), a unique witnessing tool is available in your choice of Crystal Birthstones. This piece is gold and silver electroplated high fashion jewelry. It measures 1 1/4" H x 1 3/4" W. Comes gift boxed with a beautifully illustrated Gospel Pin(R) Story Bookmark Keepsake. Handmade Genesis Creation Pins or Pendant's! This pendant has a shiny gold heart encasing two small petite brushed satiny hearts in 24K Gold, representing Father, Son and Holy Ghost. Will look great on any chain of your choosing. The pendant measures 5/8" W x 3/4" H. This heart will always remind you how much God loves you and engulfs you with His love like the two small hearts nestled inside the larger one. Comes gift boxed with scripture card. 925 Sterling Silver Square Pendant with Gold Cross. Perfect pendant for the eloquent lady preferring a timeless piece that will certainly show her faith. To be worn on a chain of your choice. Dimensions are 1/2"W x 1/2"H. Comes gift boxed with scripture card. 925 Sterling Silver Square Pierced Earrings with Gold Cross. 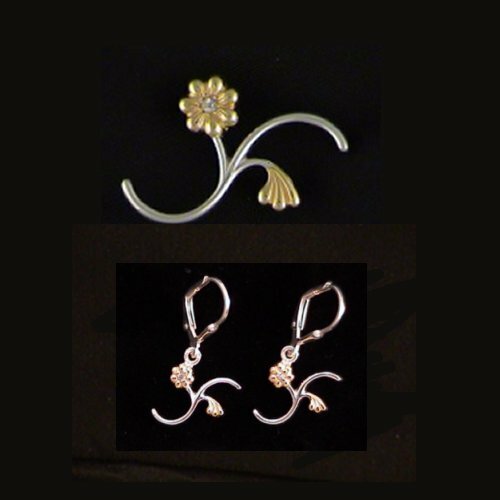 Eloquently petite matching Sterling Silver pierced Earrings to the above Pendant. Post is Sterling Silver. Dimensions are 3/8"W x 3/8"H. Comes gift boxed with scripture Card. Affordable and so appropriate for the right friend. 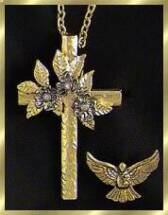 Very classy set in Sterling with 24K Gold Plated Cross Pendant and matching earrings. Save $5.00 when you purchase set. This stunning heart pendant so appropriately reminds us just how much God loved the world, that he gave His only Son to die for our sins on Calvary. This 925 Sterling Silver and 24K Gold plated Pendant is `1 1/8" W x 1 6/8" H and may be worn on a Gold or Silver chain of your choice. The Gospel Pin (R) has a white Topaz stone in the top flower. Gift boxed with a beautifully illustrated Gospel Pin(R) Keepsake Bookmark illustrating the story of just how much God loves us all. 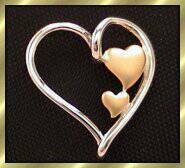 Shimmering Sterling Silver Heart, cracked, but mended by the Healer, Jesus Christ by what He did on Calvary. The pendant is 925 Sterling Silver with a cross plated in 24K gold. Can be worn on your choice of chains. Dimensions are 7/8" wide by 1" high. Gift boxed with Scripture card enclosed. Would make a wonderful gift for anyone who has been hurt and needs to be reminded of just how much Jesus loves them and is able to mend the brokenhearted. This design is so stunning, everyone will be asking you about it. What an opportunity to tell someone about John 3:16 and just how much God loves the world, that He gave His own begotten Son, Jesus to die on Calvary for our sins. The rubies remind us of His blood shed there that remarkable day over 2000 years ago. Dimensions of this pin are 1 2/8" W x 1 3/8" High. Comes gift boxed with beautifully illustrated Scripture card. This time appropriate beauty can be worn on a lapel as a pin or on the included chain as a pendant. Even the words, “Don’t Worry” are on the Pin along with 6 beautiful Austrian crystals. With all the things going on around the world these days, we sometimes are easily tempted to worry. This is the perfect gift for that “worry wart” in your life. It beautifully illustrates Matthew 6:25-33, where the Lord reminds us that we have nothing to worry about. He will be faithful to take care of us. Comes gift boxed with scripture card illustrating Matthew 6:25-33. Dimensions are 1 ½" W x 2 ½" H.
These pieces have a beautiful satiny brushed finish. Would look great with any outfit. Comes gift boxed with scripture card. What a beautiful way to share your faith. Dimensions " 5/8 W x 1" H.
Perfect match for your Pedal Pendant. Satin brushed Sterling will make a stunning statement of your Faith. 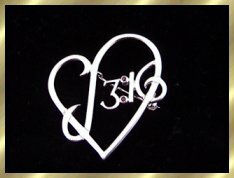 Dimensions 3/ 8 "W x 1/2" H.
Purchase the Pendant and matching Earrings as a Set and SAVE $5.00. Comes gift boxed with scripture card. Without Faith it is impossible to please God. Wearing this very attractive bracelet will always remind you of the fact that: F=forsaking A=all I=I T=trust H=Him. The bracelet measures 8" long with a claw catch. Perfect for a man or a woman to wear. Comes gift boxed with scripture card. This stunning pendant measures 1 1/8" W x 1 3/4" H. The 24K Gold plating is made to look somewhat like a material or etched finish. It is very attractive. To be worn on your choice of chains. This piece will certainly make a statement of your faith as you wear and enjoy its beauty. It comes gift boxed with a scripture card. The picture does not do this pendant justice. It is very attractive. The finish is ribbed like an old rugged nail would be, so it reflects lights from all angles while it is dangling from your chain. The rubies sparkle from each nail head to remind us of the shed blood on Calvary over 2000 years ago. The tie tack post and catch are both sterling silver. This pendant measures 1/2" W x 3/4" H. Comes gift boxed with a scripture card. Two rugged looking nails form this beautiful Cross. Inlayed with three shiny Rubies, reminding us of His blood shed on the Cross over 2000 years ago. The dimensions are 1/2" W x 3/4" H. The Tie Tack post and catch are both sterling silver. Perfect for a man or woman to wear on lapel, tie or scarf. It would even look nice on a hat. Comes gift boxed with scripture card. The Armour of God tie tack is perfect for a man or woman to wear on a lapel, tie or hat. This appropriately reminds us to put on our Full Armour of God everyday spoken about in Ephesians 6. The tie tack has a sterling post and clasp. A shimmering black offsets the Armour for the perfect accent. It measures 5/8" W x 5/8" H. Comes gift boxed with scripture card. These cuff links will be perfect for your husband, father, brother or even your Pastor or Sunday School Teacher. This very stunning set will look wonderful accenting any shirt, even ladies. Measurements are 5/8" W x 5/8" H and the sterling silver cuff link itself is also 5/8" long. Comes gift boxed with a scripture card reminding us to put on the Armour of God everyday from Ephesians 6. This remarkable Dove is such a wonderful reminder of the Holy Spirit in our lives, but also if you look very closely the Dove is holding the Gospel Pin(R) in its beak, as though it's delivering a message from above. The detailed craftsmanship of this Dove is truly remarkable down to the the Dove's eyes. 24K Gold Electroplated, measuring 1"W x 5/8" H. There are 2 posts on the back of the tie tack to embrace your piece snugly so that it does not spin on your outfit. Comes Gift boxed with scripture card about the Holy Spirit and a Keepsake Gospel Pin (R) Bookmark. This beautiful textured Cross, Dove & Dogwood Pendant set may be worn six different ways. The Dove Pin itself holds the Gospel Pin (R) in its beak, while the Dogwood Pin displays lovely Australian Crystal Stones. Dimensions: Cross 1 7/8" W x 2 6/8" H and comes Gift boxed with Legend of the Dogwood Tree Story Card. As you know the story of the Gospel is all about what Jesus did for us all on the Cross, so how appropriate it is to illustrate the Gospel Pin (R) itself on the Cross. This is a pendant to be worn on a chain of your choosing. The Cross itself has a textured Sterling Silver finish to give the "ole rugged Cross" effect. 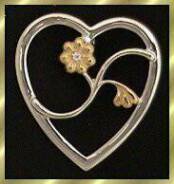 This Pendant is 1 1/8" W x 1 6/8" H. The Gospel Pin has a white Topaz stone in the top flower. Gift boxed with a beautifully illustrated Gospel Pin (R) Keepsake Bookmark, illuminating the story of Jesus Christ's death and Resurrection on the Cross at Calvary. Size may appear larger than actual size. See Dimensions. Jewelry pictures are LARGER than actual size. Please see Dimensions when ordering! Your choice of Creation Pin/Pendant comes with a 24" Gold plated chain. When I first got started making jewelry I handmade my scripture pieces. These two styles of the "Creation Pin" or "Adam and Eve in the Garden" are the only ones I have left, but in very limited numbers. Now, they have become a very collectible item. Each piece is signed on the back. These pins can also be worn as pendants. They have an antique finish using many embedded symbols that depict the story of Adam and Eve in the Garden, right down to the serpent. Be blessed as you choose one. "All Designs by Di" are copyright protected. The Gospel Pin(R) and all pieces with a Gospel Pin symbol on them are protected by a Registered Trade Mark, as well as the name, "Gospel Pin"(R) and the company name Kairos International (R). Thank you for respecting these Copyrights and Trade Marks."